Do you remember your very first project? You know the one that made you feel like you truly created something? 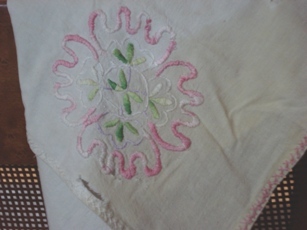 For me, my very first piece was this small tablecloth I made in fourth or fifth grade I think. It took me a while to complete it because I tried to carefully make each and every stitch. Every afternoon at craft time, the class would spend some time working on their own individual project or piece. 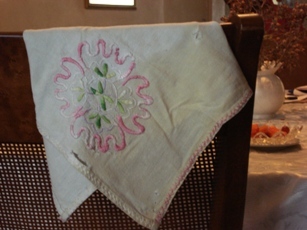 I remember carefully folding the edges to make the cross or herring bone stitch as my teacher called it and searching through books to find the unusual embellishment that I embroidered in the corner of the cloth. Of course that was some years ago. I actually found it last weekend in my mother’s kitchen – she had kept and both used it all these years, so as you can imagine it’s not as ‘new looking’ as its once was.